Perform is the ideal choice if you want expert help recovering from an injury, want to boost your athletic performance, increase your power, get precision strength and performance coaching, or learn to move with maximum skill, grace, and efficiency. Who is Perform for and what do we expect from you? Perform is perfect for situations where fat loss and aesthetic considerations are secondary goals to injury rehabilitation, maximising strength, athletic performance, or natural, skills based movement potential. Across a range of sports and disciplines; footballer, skier or boarder, rugby player, triathlete, cyclist, runner, strength athlete or track and field competitor, optimising your body for the precise demands placed upon it will help you to realise and maximise your true potential. Whether you’re an elite level athlete or sportsperson, amateur, or committed weekend warrior, developing your strength, fitness, functionality and power to eliminate your weak spots can explode your performance and take your game to the next level. Those who want access to advanced clinical testing that can identify factors that are gridlocking your performance and/or recovery. Expert, precision coaching and a no-stone-left-unturned approach. 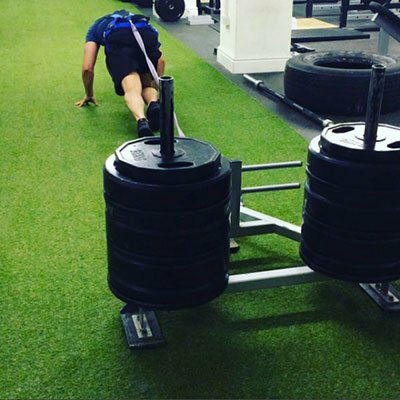 Our passionate, dedicated Perform personal training team comprises of team GB age group athletes, natural movement specialists, world champion powerlifters, and international level strength coaches with degrees in strength and conditioning. “He who chases two rabbits catches neither.” If increasing your personal performance through expert coaching is your primary goal, all others – such as fat loss or aesthetics - must necessarily come second. When you split your focus between two objectives, competitive inhibition usually occurs and you end up achieving neither. Having said that, unless your goal necessarily involves carrying a specific amount of body fat, you should expect to become optimally lean and functionally muscular through Perform training and nutrition protocols. Perform is a training programme that is naturally tailored to your personal goals. However, it’s always underpinned by extensive postural and movement analysis and optimisation – this is the basis of achieving any performance related goal. Mobility, flexibility and injury rehab are necessarily the foundation upon which optimised performance is built. If you’re recovering from an injury, or if aches, pains, musculo-skeletal restriction and poor posture are holding you back from engaging in exercise or holding you back from progressing, this aspect of your Perform programme will be paramount. Often working together with physiotherapists, soft tissue therapists, osteopaths, chiropractors, we’ve achieved success in returning a range of athletes to success, even from very serious injury. What’s different about Optimised Perform? Our skills in the sports performance and natural movement arena go far beyond ‘standard’ personal training. Or to put it another way; when you’re stronger, more powerful, have corrected postural issues, optimised nutrition, supplementation, essential lifestyle factors, biochemistry and psychology for your specific goals, you’re going to explode your performance and leave the competition in your wake.